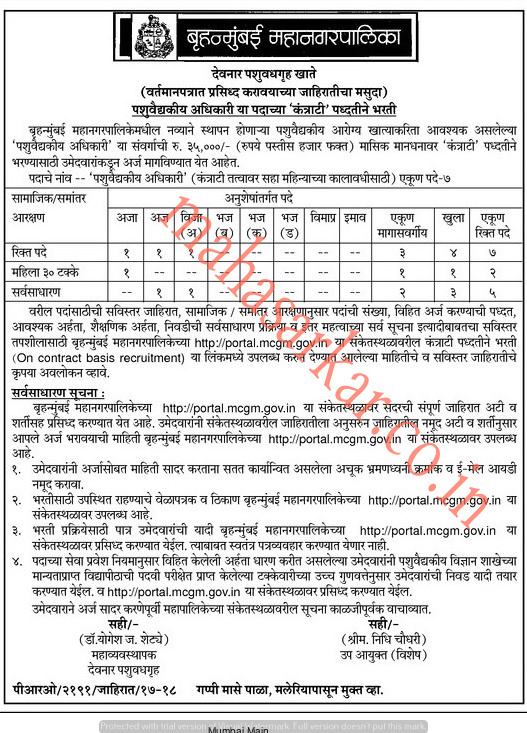 Municipal Corporation of Greater Mumbai (Brihan Mumbai Mahanagarpalika), Mumbai Published Job Notification for 07 Veterinary Officer Posts. Candidates who wish to apply must look at Municipal Corporation of Greater Mumbai Veterinary Officer Recruitment 2018. Eligible candidates can apply offline before February 2018. Age Limit: For Open Catagory 35 Years and for Reserve Category 40 Years. Interested & Eligible candidates can apply online through the website www.mcgm.gov.in earlier than the due date. Starting Date, Last Date to Apply Offline at Brihan Mumbai Mahanagarpalika which candidates should be remember as follows.